Sarah Pickering’s photographs disturb our sense of security and illuminate the ways in which we cope with traumatic events that are beyond our control. 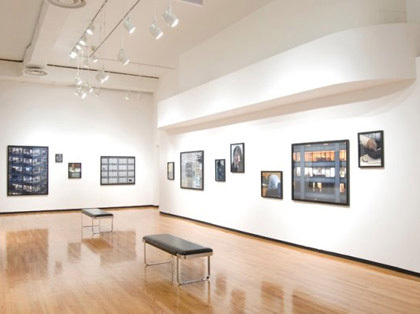 Her images depict environments and events crafted specifically for simulated training to prepare police officers, firefighters, and soldiers for calamities ranging from fire and civil unrest to terrorism and war. By exposing the artifice of simulation in the absurdity and controlled nature of these environments, Pickering questions the preparedness of planning for a catastrophic event. 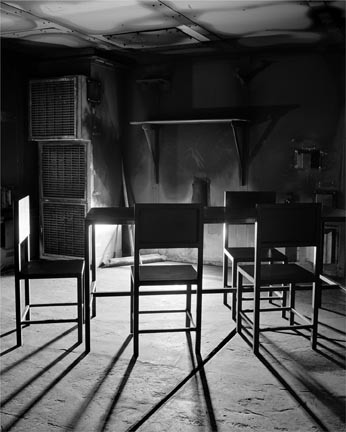 Dining Room (2008) is part of Pickering’s Incident series (2008) that was photographed at the Fire Service College in England in facilities designed for logistical and tactical training of firefighters. Inside buildings made of concrete and metal, sparse rooms are intended to be repeatedly set on fire and then extinguished by firefighters in training. Contrived scenes contain simple forms such as a steel framed bed, filing cabinets, chairs, and human-shaped dummies are made to emulate real scenarios. Pickering’s images, taken after the planned fires have been extinguished, portray layers of dust caking nearly every inch of the space, with the only evidence of human presence in finger and footprints that are etched into the ash. Pickering emphasizes a relationship to drawing and expressive mark-making by pushing the gray contrast of her matte gelatin silver prints. 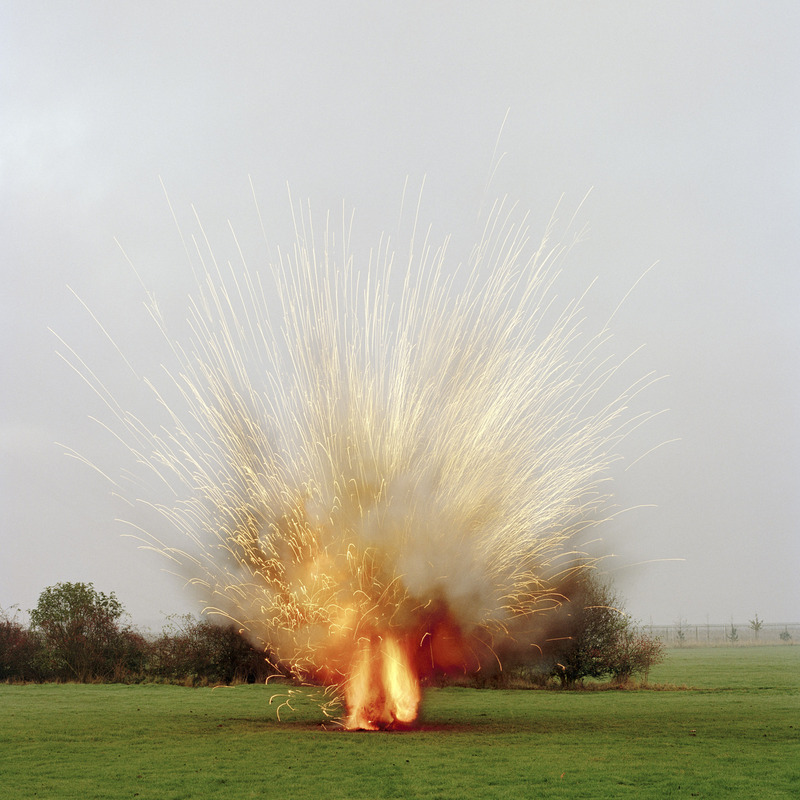 In another series, Explosion (2004-present), Pickering photographs sites where fake bombs are deployed in controlled demonstrations for military personnel interested in buying pyrotechnics. Manufactured by some of the same companies that make explosives for disaster-as-entertainment action/adventure and war films, the smaller-scale simulations of the real thing evoke the fear and drama of an actual denotation during military training exercises. Pickering captures the moment they are ignited, isolated in a benign landscape void of people and infrastructure. The images, such as Landmine (2005-2006), are titled by the weapons and chemicals they imitate–such as artillery, napalm, or shell burst. The blast hovers as if a magic trick has just occurred, capturing a fleeting moment that is mysterious, beautiful, and odd in its lack of context. In recording a simulated version of the real thing, Pickering’s images are emblematic of photography’s ambiguous relationship to the real. Born in Durham, UK, Sarah Pickering lives and works in London where she received her MA in Photography from the Royal College of Art in 2005. She has been the recipient of several awards including the Peter S. Reed Foundation (2008) and the Jerwood Photography Award (2005). Her work has been included in exhibitions at the Australian Centre of Photography, Sydney (2012); Meessen De Clercq, Brussels (2009/11); New Mexico Museum of Art, Sante Fe (2009); Victoria and Albert Museum, London (2009); Tate Britain, London (2007), and in a solo exhibition at the Museum of Contemporary Photography in 2010. Pickering’s monograph Explosions, Fires and Public Order (2010) was published by Aperture and the Museum of Contemporary Photography.